Second quarter U.S. economic growth was upwardly revised in August, reflecting the strongest quarterly growth rate in more than two years. Across the major asset categories, global equities experienced modestly positive returns, with performance generally stronger in international markets, while fixed income markets experienced a modest flight-to-quality rally, benefiting higher quality sectors. Despite a potentially more favorable U.S. growth backdrop, energy-infrastructure assets experienced significant downside. The second estimate of second quarter U.S. GDP growth, released by the Bureau of Economic Analysis on August 30, shows that economic growth has accelerated at a stronger rate than was first estimated, with real GDP accelerating to 3.0%, 40 basis points (bps) higher than the “advance” estimate of 2.6%. The 3.0% quarterly growth rate was the strongest since first quarter 2015 and helped propel the year-over-year (YoY) rate from 2.1% to 2.2%. While the 2.2% YoY rate was essentially in-line with 12-month measures witnessed in the current economic expansion, the 3.0% quarterly growth rate garnered significant attention. Encouragingly, the Atlanta Fed’s GDPNow™ current quarter GDP model estimates third quarter growth at a solid 2.9% as of September 6, 2017, although the model estimate has grinded lower in recent weeks. The level of “slack” in the economy that has existed since the 2008-2009 Global Financial Crisis appears to have been almost completely been worked off through the second quarter, as the output gap narrowed to -0.3%, reflecting realized growth that is essentially in-line with potential growth. The combination of a somewhat mature economic expansion, a nearly closed output gap, elevated valuations across most risky asset categories, and the prospect for late-cycle fiscal stimulus has the potential to lead to elevated inflation rates over the medium-term horizon. Since February, however, inflation has cooled materially and expectations for near-term stimulus measures have taken a backseat, as the U.S. grapples with rising geopolitical tensions surrounding North Korea, natural disasters, and debt ceiling negotiations. In summary, U.S. economic growth was revised upward to 3.0% in the second quarter, reflecting the strongest quarterly growth rate in more than two years. Meanwhile, the level of "slack" in the economy has diminished significantly since the Global Financial Crisis—with the output gap closing in on 0%—and any introduction of fiscal stimulus has the potential to drive sagging inflation rates higher over the medium-term horizon. Equity returns were modest in the U.S. despite strength in earnings; nevertheless, August marked the eighth consecutive month of positive returns for the S&P 500. Small cap stocks continued to underperform in 2017, retreating from lofty valuations coming into the year. Growth continued to outperform against value, as technology stocks led the U.S. equity market. Weakness in the energy and financials sectors exacerbated the divergence in performance, as these two sectors comprise more than 35% of the Russell 3000 Value Index and less than 5% of the Russell 3000 Growth Index, respectively. 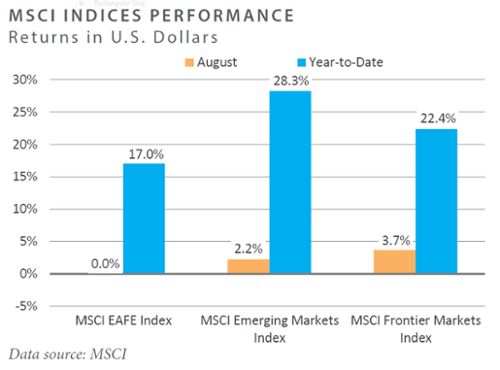 International developed markets were essentially flat in August despite continued positive momentum in economic growth. The euro zone reported the highest GDP growth since 2011, while Japan reported an unexpected 4% GDP growth for the second quarter. The euro zone experienced a welcome rise in inflation to 1.5% and consumer confidence neared a 10-year high; however, persistently low inflation in Japan remained a key concern. Emerging markets posted more strong returns, with the region significantly outpacing developed markets for the year. China—which comprises a significant weight in emerging markets indices—was the key driver of strength in the emerging markets, as second quarter GDP growth was just shy of 7%. A weaker dollar continued to provide additional support. Corporate earnings have continued to exceed expectations and could enjoy a small tailwind due to the weaker dollar; earnings strength has kept corporate default expectations benign. The Fed plans to shrink their balance sheet relatively soon and expectations for a rate hike in December have muted considerably. The market is currently implying a 37% probability of a third rate hike by year-end, down from 57% at the end of June. Risk-on sentiment continued to rally, with no major changes to the stability of corporate credit fundamentals. Developed and emerging market debt has continued to perform well, benefitting from the broad decline in the U.S. dollar. The yield curve flattened slightly for the month due to declining rates at the long end of the curve. This was seen by some as a minor flight to quality stemming in part from geopolitical concerns around North Korea. Domestic and international real estate securities were relatively flat in August, which can be attributed to investor reluctance around broader macroeconomic activity. Domestic REITs had positive growth in the industrial real estate sector (+3.6%), which benefitted from strengthening fundamentals following the second quarter’s improved GDP estimate. International real estate securities were positively affected by continued capital inflows in the office and mall sectors throughout Europe and Asia. Oil prices gained 1.4% in August and closed at $47.26/barrel. Hurricane Harvey helped support energy prices, as demand began to exceed supply. Additionally, a weaker dollar and backwardated futures curves assisted oil gains. Master limited partnerships retreated materially in August, in part as a response to the potential damage Hurricane Harvey might have had on energy infrastructure in the affected areas. The broader commodity market, as measured by the Bloomberg Commodity Index, rose a modest 0.4%, supported by the 9.6% gain in the industrial metal sector. Industrial metal prices, such as copper and aluminum, were buoyed by demand exceeding supply by the highest levels in a decade. Volatility levels rose from historic lows but remained below long-term averages, largely due to geopolitical tensions and contentious debates in Washington D.C., including the impending debt ceiling deadline. Rising volatility particularly benefitted quantitative strategies such as statistical arbitrage and managed futures. Distressed and credit strategies tended to lag throughout the month due to rising levels of macro uncertainty. Discretionary global macro managers had their sights set on the Jackson Hole Symposium, which seemingly failed to deliver any substantial forward guidance on interest rate hikes or balance sheet reductions. As a result of what many believed to be dovish commentary from Federal Reserve Chair Janet Yellen, falling interest rates and the depreciation of the U.S. dollar generated mixed—but slightly negative—performance for discretionary managers. The information provided on this site is for informational purposes only and investors should determine for themselves whether a particular service or product is suitable for their investment needs. Please refer to the disclosure and offering documents for further information concerning specific products or services.